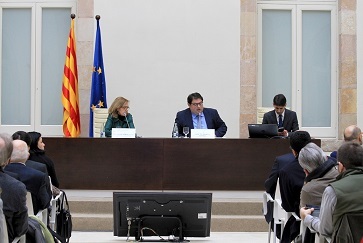 The Catalan Council of the European Movement (CCME) held its annual general meeting yesterday, which served to renew Xavier Ferrer as President and Joaquim Millán as General Secretary. The role of the City Council of Terrassa is still important, as the representative of the municipalities in the Executive Committee. The CCME is a plural and independent association formed by groups and people who develop activities in Catalonia to improve the idea of Europe. It is composed of a broad representation of the Catalan society: political parties, businesses and trade unions, municipalities, universities, economic, professional and academic associations that wants to be the reflection of the professional plurality, ideological and political of civil society in Europe. It’s a member of the international European Movement, created in 1948. The CCME has organized many activities with the City Concil of Terrassa, like a concert, a conference about cultural traditions in the EU and many others. The CCME also gave an european award (Diploma d’Europa) to the public main library of Terrassa (Biblioteca Central de Terrassa).